The BJP on Saturday said that that "corruption circus" of Arvind Kejriwal government stood exposed after Water, Tourism and Culture Minister Kapil Mishra was sacked from his post. 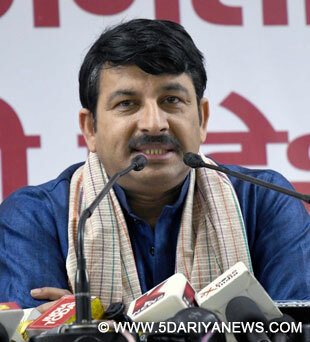 "After today's statement of Kapil Mishra, the corruption circus of Kejriwal government stands exposed," said the Bhartiya Janata Party (BJP) Delhi chief Manoj Tiwari. "It is now established that public money has been looted in Delhi Jal Board Tanker Scam by (Delhi Chief Minister) Arvind Kejriwal government," he alleged.Lashing out at Kejriwal, Tiwari, who also represents Delhi Northeast parliamentary consituency, said: "Kejriwal not only owes a explanation to the citizens of Delhi but it is high time he submits his resignation for being involved in this water tanker corruption racket. "The BJP leader's remarks came soon after in a sudden move, Kejriwal on Saturday axed Mishra, who had said that he had told the Chief Minister that he would not a delay in tanker scam report and would submit names of those who are involved in the delay to the Anti-Corruption Bureau.